Organised by NIPTICT, the Ministry of Posts and Telecommunications (MPTC) is preparing a new Startup Policy to support the growth of Cambodia’s startup ecosystem– kicking off with a Startup Policy Hack on 6 February from 8.30am to 12.30pm! The Start-up Policy Hack is a special platform, which brings audiences and partners together to discuss the difficult challenges that digital disruption brings to the public sector, in its role to set the rules of the game for entrepreneurs and innovators. Participants can definitely expect to have a unique experience during the event as this version is unlike any other. Unlike traditional policy hacks where challenges are chosen by a committee of organisers, the Startup Policy Hack relies on its participants to bring on the challenge. The Hack recruits participants who will bring a specific challenge they are facing in their home ecosystems, along with an idea of how to address such a problem. Participants will then present their challenge to the organisers, refining and validating the proposed solution via government-enterprise dialogue. Also, though policy hacks traditionally present challenges to the teams only on the day of the event itself, the Start-up Policy Hack requires that participants engage in portions of the Hack before and after the forum. In fact, participants must come with a minimum level of preparation in order to maximise the value and return home with a workable solution. Participants will also be exposed to the concept of regulatory sandboxes, which are being rolled out in a number of countries that are actively grappling with the conflicts and regulatory misalignments. This naturally arises when traditional industries, such as transportation, healthcare, education, banking and more are suddenly disrupted by innovative new players. All in all, to address the challenges of digital disruption, the government cannot act in isolation. 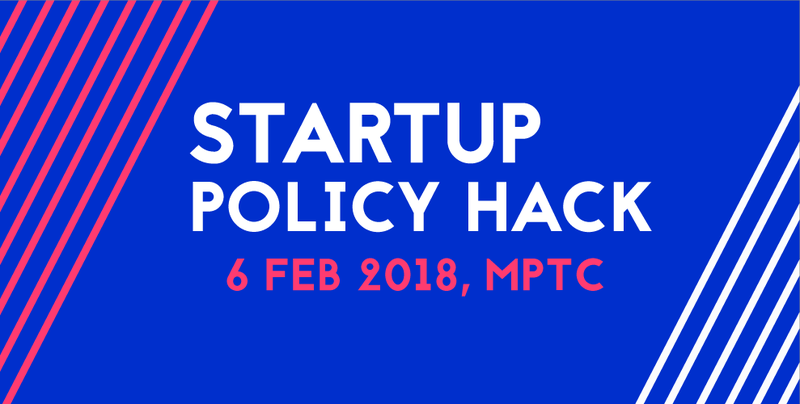 The Start-up Policy Hack invites participants who are interested in designing new approaches to experience multi-stakeholder dialogue that is open, collaborative and output-oriented. So if you are interested in registering for this event, you can head down to https://startuppolicykh.eventbrite.com to register for tickets now!